Regular MRI review of tumors is necessary. Pattern of either tumor growth, stability-no growth can last years and change to dangerous increased rates of tumor growth, with the individual not experiencing noticeable symptoms. Due to tumor locations individuals with NF2 die from tumor damage each year. Not all tumors will require treatment beyond observation. There is no cure for NF2 and treatment options are limited. MERLIN Syndrome. derived from the Moesin-Ezrin-Radixin-Like Protein, (Schwannomin, is the missing or nonfunctional protein that causes NF2 tumor growth. Neurofibromatosis type II (NF2) is a rare genetic autosomal dominant, neurological, and neurodegenerative, tumor predisposition condition which results in slow-growing typically benign (noncancerous) tumors, primarily located in the central nerve system (CNS); brain and spinal cord. 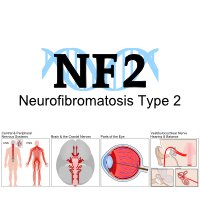 NF2 typically can cause numerous issues during an individual's lifetime. However, not all issues are tumor related. Tumors can occur in other parts of the body, not just the CNS, but can also include tumors along the peripheral nervous system (PNS), nerves. PNS tumors can include tumors seen as firm bumps under the skin. NF2 tumors can result in different forms of nerve, brain, and body damage. 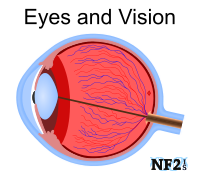 NF2 is a neurological disorder that results in tumor growth as well as eye issues unique to NF2; some are unrelated to tumor nerve damage, such as juvenile cataracts. Treatment options available today can only treat one tumor at a time. Surgery to completely remove a tumor, for individual tumor management is the only way to guarantee a tumor will do no additional damage. While NF2 is a genetic disorder, fifty percent (50%) of people born with NF2 is the result of spontaneous mutation, no family with NF2. Since NF2 is rare, it makes it difficult for early intervention of issues. Delays of problematic tumors can result in serious consequences. Tumor growth rate at different points in the life of an individual will vary; the reasons may include; exact NF2 mutation, hormones, and life/environment factors. Each tumor in an individual will also grow at different rates. Many NF2 health issues are the result of tumor growth and the treatments to manage growth, the exception to this are some of the eye issues that can develop. NF2 tumor types can include; schwannoma, meningioma, and ependymoma The number of tumors can vary but may result in only two (2) but may result in hundreds of tumors; minimum of two (2) of bilateral hearing related tumors. People with NF2 do not always face the same medical issues, even in the same family. 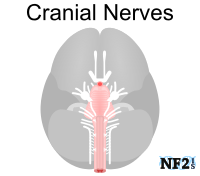 The most common tumors seen in NF2 are the hallmark bilateral (left/right) vestibular schwannoma (VS)/acoustic neuroma (AN) ; these are tumors that grow on the 8th cranial nerve in the brain, typically along the vestibular nerve branch which is the balance nerve. This tumor growth typically also damage the cochlear nerve the nerve branch for hearing. 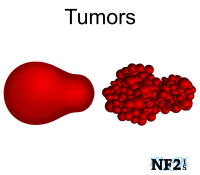 The growth of VS tumors is sometimes the only tumors an individual with NF2 might develop. If treated properly, hearing loss and balance issues. Treatment to soon might risk requirement of multiple treatments to the same tumor mass years later; the second treatment can have a higher risk of additional complications. But when tumors grow over a few centimeters, and the individual would be at risk of additional complications noted further below are more likely to occur. TThere are different types of headaches. There are also different types of migraines. As a result of the brain tumors, individuals with NF2 are likely to have occurrences of headaches and migraines. Common migraine individuals with NF2 may have include vestibular migraines, and ocular migraines (retinal migraines). Migraine types indicate different brain tumor issues and when it may be time to discuss tumor treatment options. Anyone with NF2 should see a neuro-ophthalmologist who is familiar with NF2 yearly to check for optic neurological issues that can develop. A neuro-ophthalmologist is a physician (neurologist or ophthalmologist), specializing in diseases affecting vision that originate from the nervous system. It is not that an Ophthalmologist would not be familiar enough with some of the neurological issues that are a result of NF, but tests that need to be done and reviewed require seeing a Neuro-Ophthalmologist, including but not limited to the review of actual MRI scans. NF2 can result in a variety of eye issues which can result in either poor vision or blindness. Note: Before reading further, it is possible issues mentioned after this point may not occur or are less likely to occur. Vestibular schwannoma, are schwannoma tumors along cranial nerve 8 (CN8) and are an issue that develops in many individuals with NF2. Cranial Nerve 8 travels a similar path as Cranial Nerve 7, the Facial Nerve, extending out of the brainstem right next to each other. The purpose of CN8 is hearing and balance. Individuals who develop vestibular schwannoma commonly develop damage to the facial nerve; also known as facial nerve damage, or facial paralysis. Facial nerve damage problems with; 1) inability to close eyelid, 2) tear duct and tear production issue (no tears or excess), 3) closing mouth lips for eating, 4) speech (letter pronunciation), 5) sinus, 6) appearance, 7) lack of saliva production (dry mouth), and 8) tooth decay. Individuals with any form of face weakness should also review Trigeminal Neuralgia, as issues are similar but associated with Cranial Nerve 5. Some issues a person with NF2 has can be from attempts to manage NF2 issues. Surgery, radiation/radiosurgery, tumor-drug treatment, and scan contrast can have side effects, but long-term use of prescription medication and over-the-counter (OTC) medication can also have long-term risks. An often overlooked problem was the risk potential of supplements for alternative treatments when the treatment was not in an NF2-based study long enough to learn side effects, particularly when taken at higher doses than commonly used. The Food and Drug Administration (FDA), does not monitor if supplements from bottle to bottle and brand to brand. Contents of non-pharmaceutical items may include the logos for; NSF, USP, or Consumer Labs. Most unseen dangers are from commonly used over the counter (OTC) medications and prescriptions individuals with NF2 might need to take more frequently than the average person and therefore puts them at a higher risk of side effects noted for any medication. Many NF2 Issues will require physical therapy. Some issues like walking after balance issues from vestibular schwannoma damage require proper guidance by a therapist. Nerve damage while recovering from treatments. Treatment to improve the immune system and recover faster may require a dietary change, vitamins, or supplements. To boost the immune system addition of an iron vitamin should be discussed with a doctor following a blood test. Accidental use of excess or iron can result in kidney failure. Many with NF2 only develop vestibular tumors, and if managed with surgical treatment before the tumor results in pressure to the brainstem, additional issues included in this section are unlikely. Cerebrospinal fluid (CSF), is a clear and colorless fluid that needs to continuously move through a membrane that surrounds the Central Nervous System; brain and spinal cord. Constant CSF movement from the brain to spinal cord needs to remain continuous. Tumor growth can result in issues blocking the necessary flow of CSF from the brain into the spine. There are two forms of CSF issues that can occur from brain tumor growth; intracranial pressure (obstructive hydrocephalus) and CSF leak (intracranial hypotension). CSF leak had been a common occurrence in the ten (10) days following brain tumor surgery, but surgical methods are available to lower the chances of occurrence. The kidneys are a pair of vital organs that perform many functions to keep the blood clean and chemically balanced. It is easier to maintain healthy kidneys than it is to recover from poor kidney health. The most common reasons an individual with NF2 may suffer from kidney failure include; pain medication, MRI contrast (Gd), and tumor-drug treatments. Trigeminal neuralgia, damage to CN5, is often confused with damage to CN7, the facial nerve. 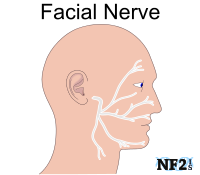 The facial nerve only controls movement, feeling in the face which is the function of Cranial Nerve 5, the trigeminal nerve. Cranial Nerve 10 is the vagus nerve. Swallowing difficulties are typically the first signs there are problems with this nerve. However, this nerve controls much more. It must be watched and handled properly if it shows signs of weakness. Muscle Control: muscles control of; heart rate, sweating, esophagus, and digestion, as well as many involuntary muscle movements in the mouth, including speech and breathing. The vagus nerve is not the only possible reason for swallowing difficulties; other reasons may be considerably less dangerous. For individuals with NF2, tumors are expected to grow on Cranial Nerve 8 (CN 8) the vestibulocochlear nerve, which controls hearing and balance. It is not uncommon for tumors on CN 8, to also damage CN 7 the facial nerve. Tumors also commonly grow on; CN 2 the optic nerve, CN 5 the trigeminal nerve, and CN 10 the vagus nerve. However; it is possible for tumors to grow and damage any other cranial nerves as well. There are twelve (12) pairs of nerves in the central nervous system, a left and a right nerve for each. Some control muscles and others control senses. People with NF2 are at risk to develop traumatic brain injury (TBI) as the result of; 1) fast tumor growth, 2) tumor-drug treatments, 3) surgery or 4) radiotherapy treatments (Gamma knife, CyberKnife, or Proton Therapy). 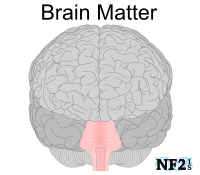 NF2 brain matter issues are; brain injury, brain trauma, cognitive issues, damaged regions or regions of the brain that do not function properly for some reason. Cognitive issues from tumor growth can be temporary particularly if the result of tumor growth or surgery. Cognition is less likely to recover following radiation/radiotherapy treatments, particularly when used as a treatment for younger individuals. Epilepsy is a brain condition in which a person has repeated Seizures over time. Seizures are episodes of disturbed brain activity that cause changes in temporary attention or behavior. A person is considered epileptic (to have epilepsy); if more than one seizure occurs. Epilepsy occurs when permanent changes in the brain cause it to be irregular concerning neuronal activity. As a result, the brain sends out abnormal signals, which can lead to repeated, unpredictable seizures. A single Seizure incident that does not happen again is not Epilepsy. As a result of tumor growth, individuals with NF2 are at risk of having Strokes. A stroke is a "brain attack." It can happen to anyone at any time. It occurs when blood flow to an area of the brain is cut off. When this happens, brain cells are deprived of oxygen and begin to die. When brain cells die during a stroke, abilities controlled by that area of the brain such as memory and loss of muscle control can occur. Strokes are the result of damage to an artery from; 1) diabetes, 2) high blood pressure or 3) lesion growth. The damage could be on an artery, inside an artery, or pressing on an artery. NF2 brain tumors are either; schwannoma or meningioma; these tumors can compromise arteries in the brain. Tetraplegia (Quadriplegia): damage to top and therefore complete spine and body. Café-au-lait Spots also known as Café-au-lait Macules (CALMS), are irregularities of the skin that could cover a 1-inch area. Café-au-lait spots are a hyperpigmented plaque-like lesion on the skin, no issue related to skin discoloration. These are not painful; they are simply a discoloration of the skin. Individuals with NF2, who have CALMS, usually have fewer than six. CALMS can also fade over time. 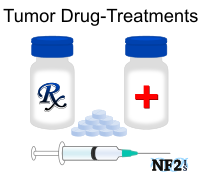 While tumors are typically slow growing and Benign, there is no treatment to stop and destroy all tumors an individual might develop as a result of the NF2 condition. Drug-Based treatments are only available in clinical trial stages at this time. Treatments are; 1) surgical tumor resection or debulking, or 2) radiation/radiosurgery of gamma knife, cyberknife or proton therapy for intervention methods for individual tumor care. Not every tumor that grows will need medical management other than observation by regularly checked MRI scans. Tumor growth can be inconsistent, and long-term stability can easily change to rapid growth. If you require help with surgical management of vestibular schwannoma or the growth of another tumor from NF2, contact the National Institute of Health (NIH). NIH can help review MRI's for recommendations of treatment options and surgical management of tumors. 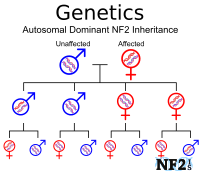 NF2 is a genetic autosomal dominant condition. A child can be afflicted with NF2 in one of two ways. He or she can 1) inherit NF2 from a mother or father who has NF2, or NF2 can be initiated by 2) spontaneous mutation. 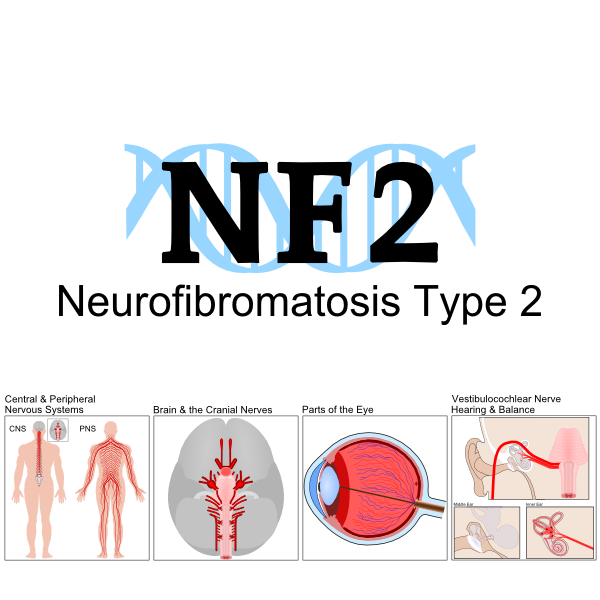 NF2 is not a disorder that can spread or someone can catch. NF2 is a condition that an individual has at birth, even though symptoms are seen later in life. The NF2 gene provides instructions for the production of a protein called Merlin (moesin-ezrin-radixin-like protein), also known as Schwannomin. This protein is made in the nervous system, particularly in specialized cells called Schwann cells that wrap around and insulate nerves. Merlin helps regulate several key signaling pathways that are important for controlling cell shape, cell growth, and the attachment of cells to one another (cell adhesion). This protein functions as a tumor suppressor, preventing cells from growing and dividing too fast or in an uncontrolled way. The NF2 gene mutations that cause Neurofibromatosis Type 2 are classified as Germline, which means they are present in all of the body's cells. Most NF2 gene mutations result in an abnormally shortened version of the merlin protein. This short protein cannot perform its normal tumor suppressor function in cells. Research suggests that the loss of Merlin's function allows certain cells in the nervous system, especially Schwann cells, to multiply too frequently and form tumors. Early in life diagnosis, and proper follow up of NF2 dysfunctions can make it easier to manage NF2 issues. Once diagnosed with NF2, doctors can begin to monitor issues with Neurological Exams and MRIs and can help look for options to slow down tumor development. Family planning and birth control is not just prevention of pregnancy but considering advantages and disadvantages of natural and alternative options to become pregnant. Knowledge of advantages and disadvantages are important since there are dangers to mothers with NF2, not just the potential child. Sometimes the issues to the child can even be more than just development of stronger case of NF2 than their parent. Discussion with doctors about prescriptions and other medications is important for a safe pregnancy. 'NF2 Information and Services' pages are meant to be shared with doctors and others with NF2 in hopes of helping more people. 'NF2 Information and Services' content is meant to be shared with doctors and others with NF2 in hopes to help more people. 'NF2 Information and Services' is not run by medical professionals. Evans, D. Gareth, et al. "Identifying the deficiencies of current diagnostic criteria for neurofibromatosis 2 using databases of 2777 individuals with molecular testing." Genetics in Medicine (2018): 1. Plotkin, Scott R., et al. "Quantitative assessment of whole-body tumor burden in adult patients with neurofibromatosis." PloS one 7.4 (2012): e35711. Evans, D. Gareth R., and Sarah Louise Ingham. "Reduced life expectancy seen in hereditary diseases which predispose to early-onset tumors." The Application of Clinical Genetics 6 (2013): 53. Steffen Rosahl, Christopher Bohr, Michael Lell, Klaus Hamm et al. "Diagnostics and therapy of vestibular schwannomas - an interdisciplinary challenge" GMS Curr Top Otorhinolaryngol Head Neck Surg. 2017; 16: Doc03. Evans, D. G., et al. "A genetic study of type 2 neurofibromatosis in the United Kingdom. I. Prevalence, mutation rate, fitness, and confirmation of maternal transmission effect on severity." Journal of Medical Genetics. 29.12 (1992): 841-846. Evans, D. Gareth R. "Neurofibromatosis type 2 (NF2): a clinical and molecular review." Orphanet Journal of Rare Diseases. 4.1 (2009): 16. Gerber, P. A., Antal, A. S., Neumann, N. J., Homey, B., Matuschek, C., Peiper, M., ... & Bolke, E. (2009). Neurofibromatosis. European Journal of Medical Research, 14(3), 102. Won, Hon-Kit, et al. "Merlin/NF2 regulates angiogenesis in schwannomas via a Rac1/semaphorin 3F-dependent mechanism." NEO PLASIA (2012). Rolton, D., Nnadi, C., & Fairbank, J. (2014). "Scoliosis: a review." Paediatrics and Child Health, 24(5), 197-203. Widemann, B. C., Acosta, M. T., Ammoun, S., Belzberg, A. J., Bernards, A., Blakeley, J., ... & Morrison, H. (2014). "CTF meeting 2012: Translation of the basic understanding of the biology and genetics of NF1, NF2, and Schwannomatosis toward the development of Effective Therapies." American Journal of Medical Genetics Part A. Conclusion: "Because new tumors can develop in NF2 patients over their lifetime and because radiographic progression and symptom formation are unpredictable, resection may be best reserved for symptom-producing tumors. Moreover, establishing the efficacy of nonsurgical therapeutic interventions must be based on long-term follow-up (several years)." Kresak, Jesse Lee, and Meggen Walsh. "Neurofibromatosis: a review of NF1, NF2, and schwannomatosis." Journal of pediatric genetics 5.02 (2016): 098-104.